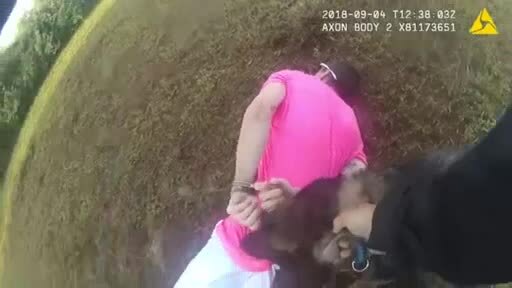 SPRING HILL, Fla.-- Dramatic body camera video shows a K9 officer taking down a suspect in Florida. It happened in Spring Hill Tuesday. You can see Pasco County Deputy Nick Carmack letting his K9 partner, Shep, out of the patrol car and helping him over a fence. Moments later, Carmack catches up to Shep who holds down 28-year-old James Miller while the deputy cuffs him. Carmack says Miller took off when he tried to pull him over for driving a suspected stolen car. The sheriff's office says Miller then pulled into a driveway, crashed into a fence, and started running. An arrest report says a 19-month-old child was in the back seat of that car. Miller was medically cleared for the dog bite and was arrested for child abuse, along with a slew of other charges. The sheriff's office says deputies later found a second person who ran from the stolen car after it crashed. That person was also arrested.